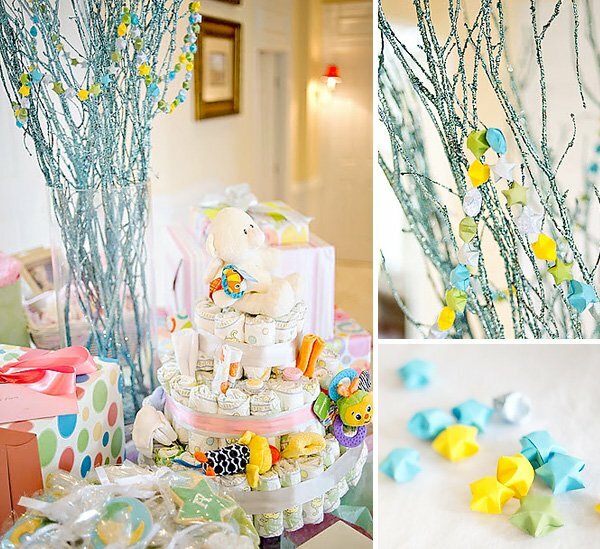 Christine from Pure Joy Events coordinated this adorable LULLABY-Themed BABY SHOWER in celebration of her sister’s new bundle of joy, and from a darling “counting sheep” mobile and tissue pom “clouds” hanging overhead to a charming dessert table displayed atop a sleigh crib, this party definitely feels like a sweet lullaby-come-true! 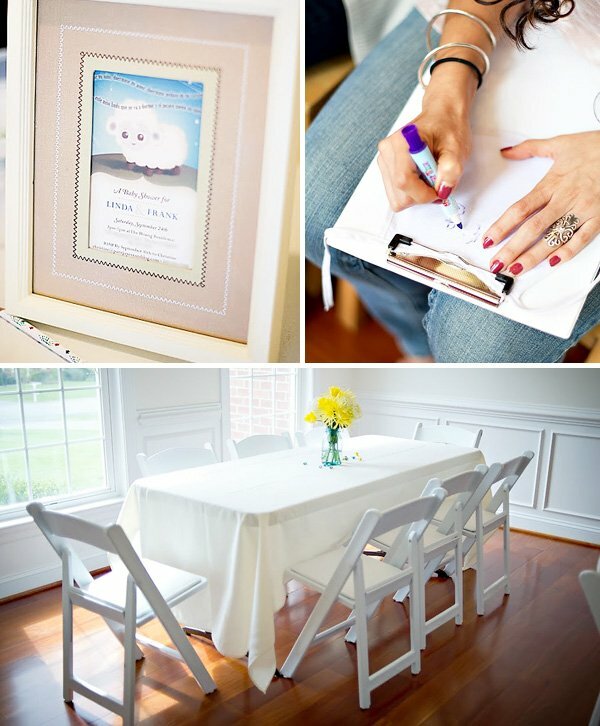 In addition to the super cute “little lamb” and “twinkle star” inspired cake and treats, I’m also loving the beautiful custom invitations and printables used throughout the party that featured artwork reminiscent of children’s book illustrations. 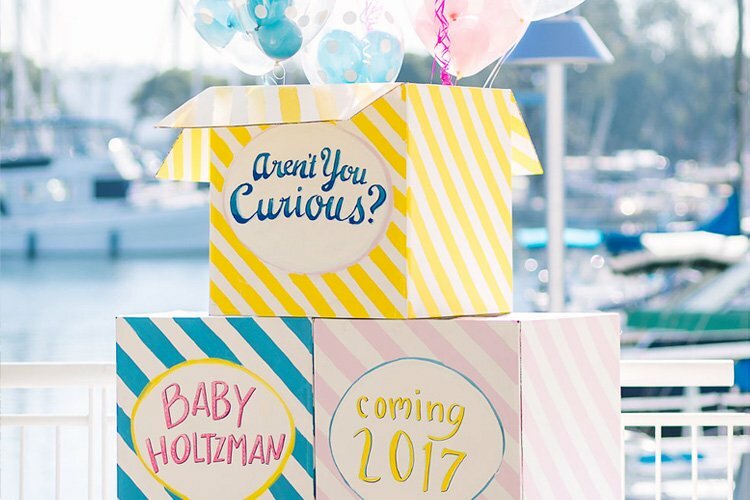 duermase mi niño, duermase mi amor, duermase pedazo de mi corazon, este niño lindo que se va a dormir y el picaro sueño no quiere venir), we came up with the idea of having a lullaby theme for the baby shower. 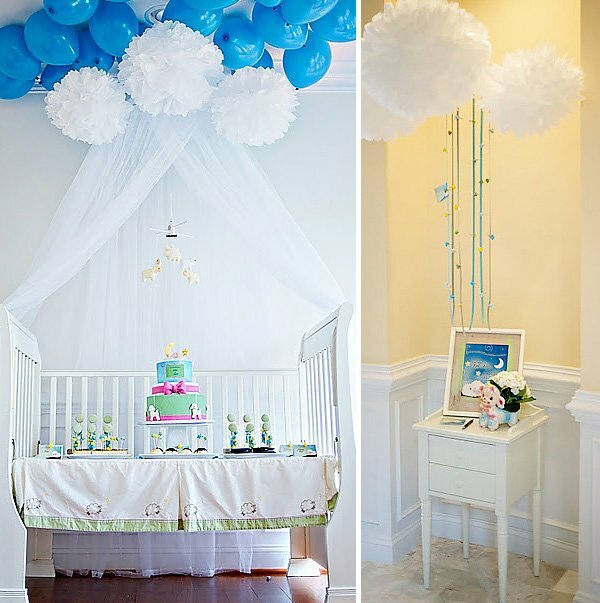 To carry out the theme, a sleigh crib with a coordinating crib skirt was used as the dessert table. 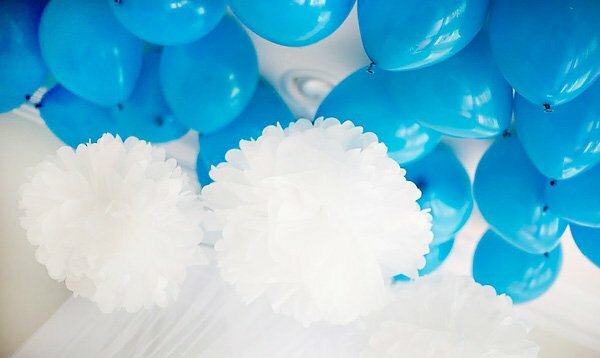 White canopy netting, pom pom clouds, and two dozen sky blue balloons created a dreamy effect. 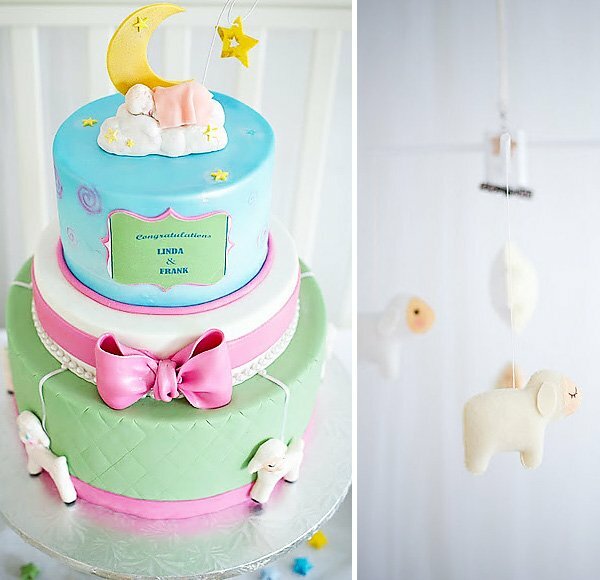 Handcrafted by Gifts Define, a counting sheep mobile was suspended above the 3-tier banana and caramel cake from PhoebeCakes. 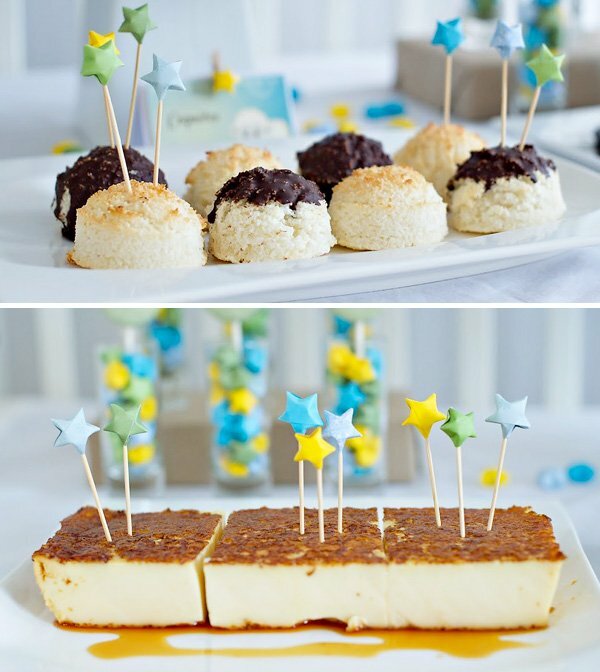 Desserts included Cuban favorites like, coquitos and flan, as well as moon pies dusted with powdered sugar. Pistachio macaroon pops with chocolate ganache made by 6 Bittersweets, were displayed in parfait glasses filled with colorful origami stars from Trinkets by Dana. 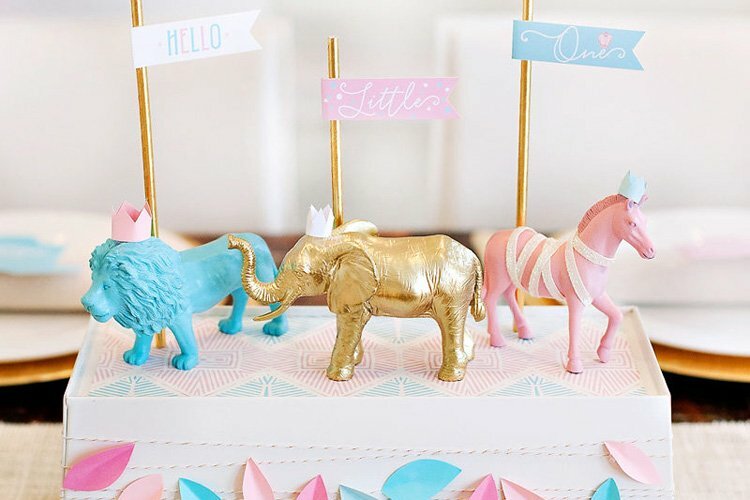 The dessert tents, invitation, and other custom printables were beautifully designed by my long time friends, Darin and Riya of Blue Lotus Company. 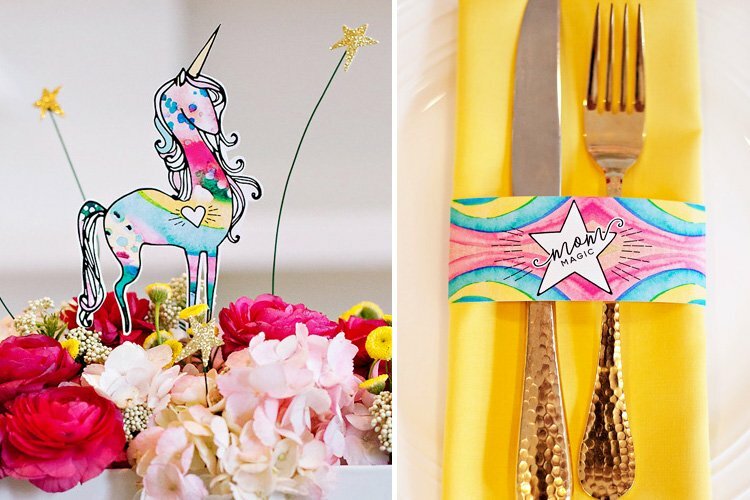 Paper stars were also sprinkled on the dining tables and used to decorate the gift table in the front entryway. 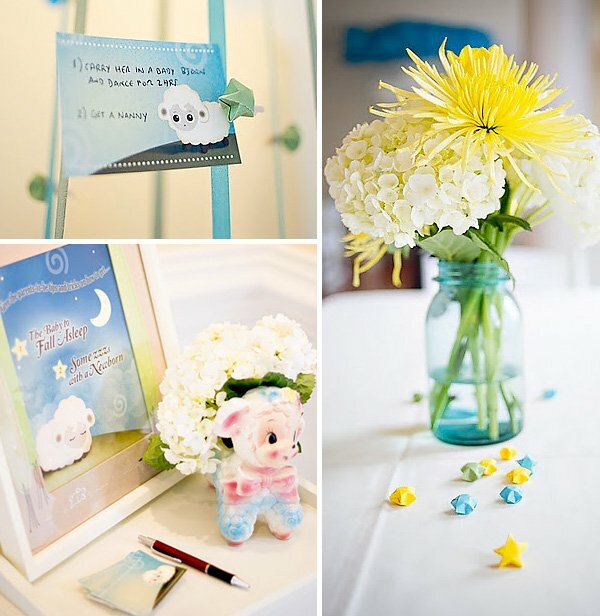 For the centerpieces, yellow chrysanthemums and tulips, and white hydrangeas were arranged in vintage blue mason jars. 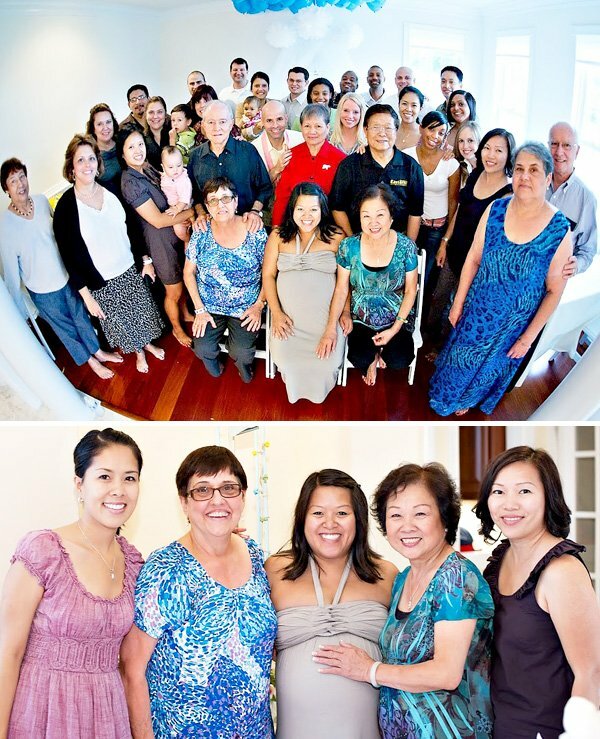 Guests were asked to give the parents-to-be tricks and tips on how to get the baby to fall asleep and how to get some zzz’s with a newborn. A hanging display was created to hold the advice cards, using long strands of ribbon and an embroidery hoop. 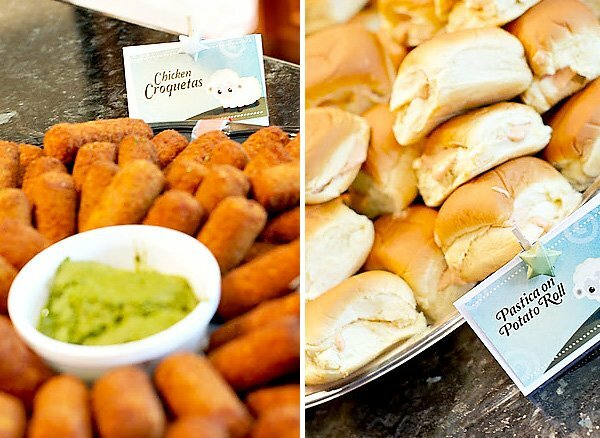 The buffet table included traditional Cuban and Vietnamese food like chicken and ham croquetas, pastica on potato roll (grandma’s recipe of deviled ham, cream cheese, ketchup, mayonnaise paste), vegetable empanadas, stir fried egg noddles, eggrolls, and more. 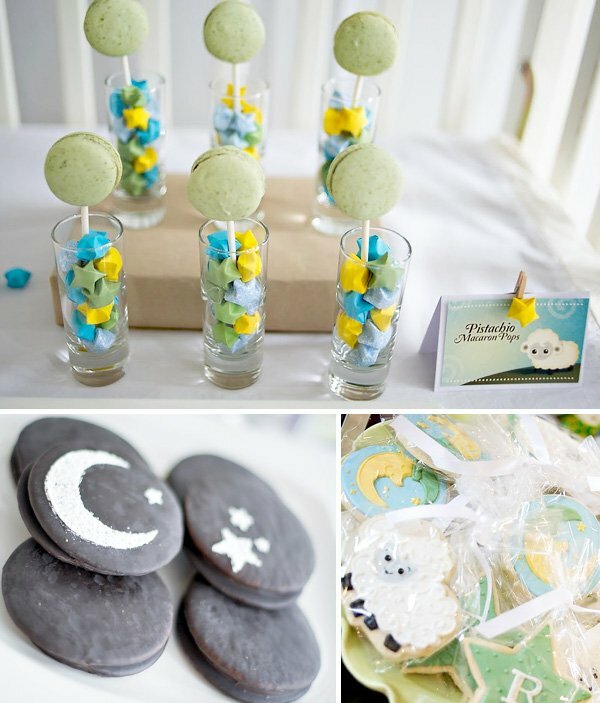 For the party favors, Renee of Bee’s Knees Creative decorated sugar cookies of white clouds, monogrammed stars, yellow moons with night caps, and lambs. SO, so adorable! I agree the sleigh bed with the cake on it was such a cute idea! Love the twinkle stars too! I LOVE this blog. Using the crib was such a great idea and the cake..the cake! Wow! Christine did a wonderful job putting the whole shower together. 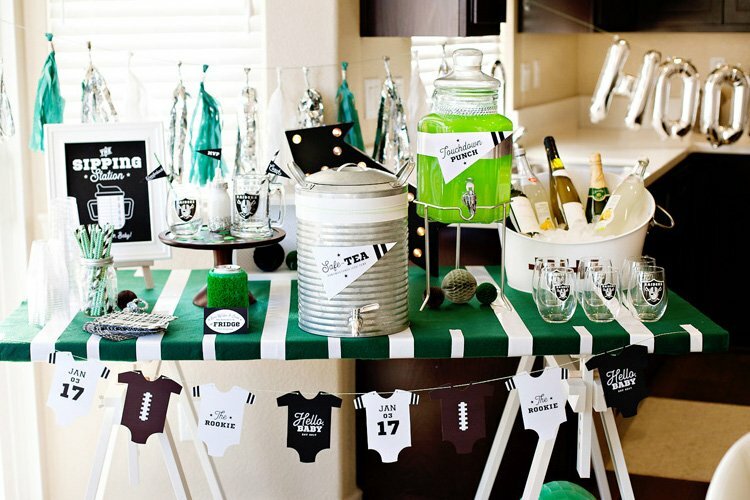 The crib as a desser table: BRILLIANT! I wish I knew someone having a baby! Love all your creative ideas!! 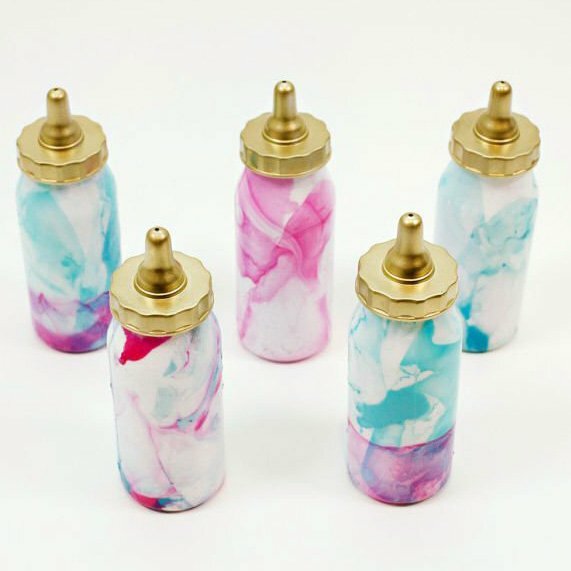 where did you get the blue sticks in jar, with stars dangled from it. Amei td bom gosto e criatividade parabéns.